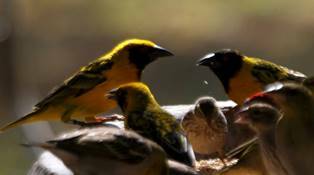 There are 117 living species in the weaver bird family (Ploceidae), excluding the sparrows of genus Passer, see species list here. Read more about the family here. Ten days were spent at Fynbos Estate to ring birds, as a BDI expedition. The ringers were Dieter Oschadleus and Manuel Puertas (Spain), assisted by trainees Samantha McCarren (Germany), Emmanuel Adekola (Nigeria), and Joel Radue. Les Underhill and Pete Laver helped with logistics and promotion (helped remotely by Megan Loftie-Eaton). On two mornings the Tygerberg ringers (Margaret McCall and Lee Silks with their tranees) kindly let us join their ringing at two farms, Goedeontmoeting and Rocklands. A total of 375 birds of 27 species were caught at Fynbos Estate, including 31 recaptures of birds caught on earlier days, oe in May 2018. 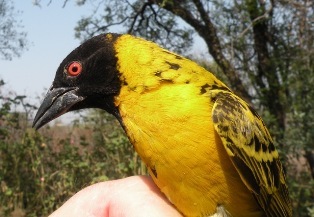 The most ringed species was the Cape Weaver, and the most recaptures were of the Cape Robin-chat. Migrants caught included Barn Swallow and African Paradise Flycatcher. 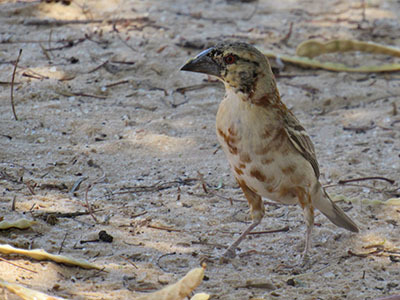 Other exciting captures included Lesser Honeyguide, and its host - Acacia Pied Barbet. At the two farms, and additional ten species were caught by our group. 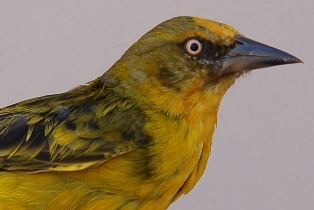 At Goedeontmoeting a female Southern Masked Weaver (ring BH60921) was recaptured 8.6 years after it was ringed. Moult analysis. 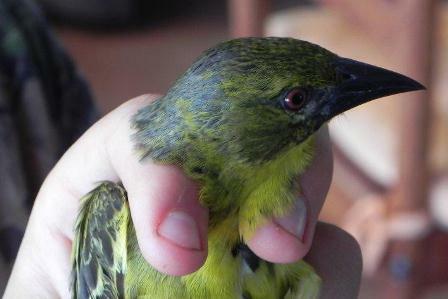 We ringed many Cape Weavers at Fynbos Estate. 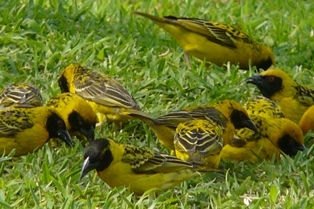 Moult score was calculated (some birds were not scored due to high catch rate), with an average score of 48.1 (n=49). 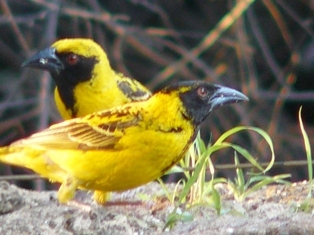 This was compared to Cape Weavers caught in Cape Town wetlands in February over years 2015-2018, giving an average moult score of 41.9 (n=16). 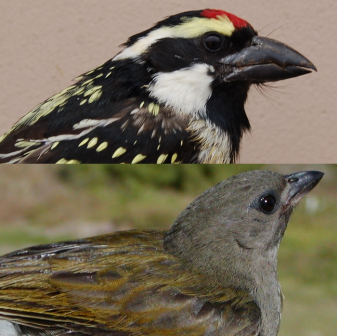 Thus rural weavers (at Fynbos) seem to have advanced moult scores due to starting moult earlier, and also completing breeding earlier, than urban weavers in Cape Town. Although small sample sizes, this illustrates the potential for ringing studies. A variety of projects are planned for on-going expeditions to Fynbos Estate. 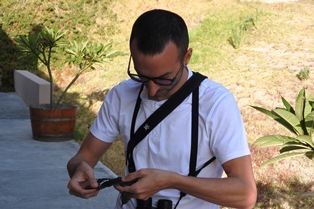 See more photos and text about the ringing location and birds from this amazing expedition. 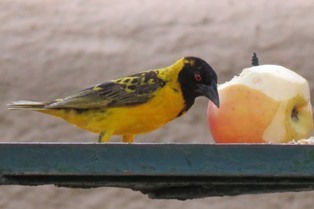 Christa Moller emailed photographs of a Village Weaver male at Zwartkloof N.R. 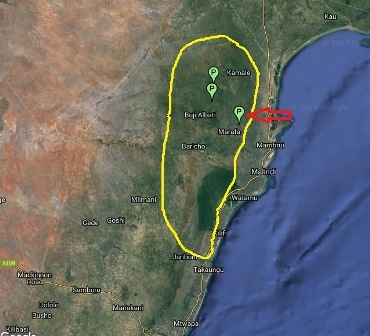 Bela Bela, Limpopo Province, South Africa. 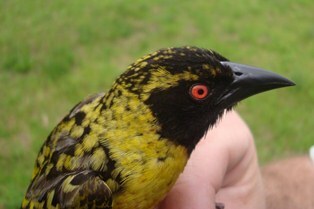 The male had a black head, resembling the subspecies nigriceps. 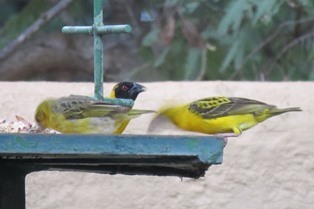 Christa first noticed the male at the bird feeder on 03/03/2019 and again on 04/03/2019. 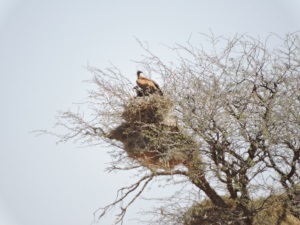 Christa did not observe this male in the fever tree where the normal-plumaged Village Weavers are nesting.